This post contains amazon affiliate links, which means that if you make a purchase through one of these links I will get a small commission. For our second anniversary I gave him a bathrobe; he gave me jewellery. “I thought we decided to do traditional anniversary gifts, ” I said to him, “second year is cotton.” Finally, for our third year we were in sync and gave each other traditional leather gifts. Fourth year was much more difficult. Old school guides suggested that year four is the year of flowers or fruit, however, modern interpretation of that year said that it was the year for appliances. After a few weeks of hints I finally got a Slow Cooker. And not a moment too soon. Since my oven stopped working, the slow cooker got a lot of use. Up until a few weeks ago I did not realize how much I rely on the oven. I don’t have a microwave, so leftovers get heated in the oven. I cook in the oven so much, that I actually have a cookbook that just came out on August 2018 called Ultimate One-Pan Oven Cookbook: Complete Meals Using Just Your Sheet Pan, Dutch Oven, Roasting Pan and More. It contains 75 original delicious and easy recipes all made in the oven, all made on just one pan! 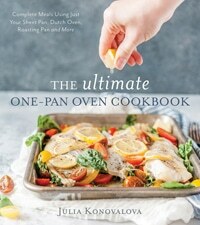 If you love using your oven just like I do, The Ultimate One-Pan Oven Cookbook is THE cookbook to have. It’s also absolutely perfect as a holiday gift! So, for the past two weekends I’ve been slow cooking my food and trying to come up with ideas of what I could make on the stove that would be easy, convenient, and fast. Savoury Vegan Potato Cakes popped into my head recently and I finally got a chance to make them. Are Stuffed Potato Cakes same as Russian Zrazy? 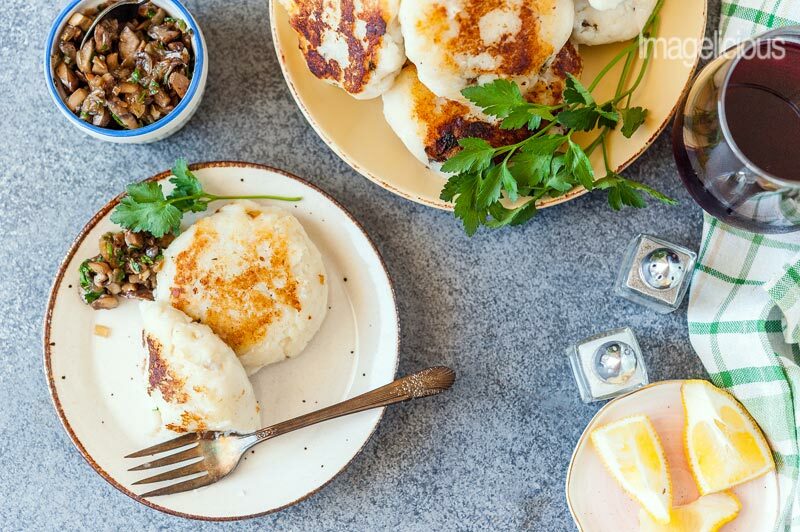 Stuffed potato cakes are actually a traditional Russian dish called Zrazy. There are many different kinds of Zrazy, some are meat based, some are vegetarian, but the basic idea behind the name is that it is something stuffed. 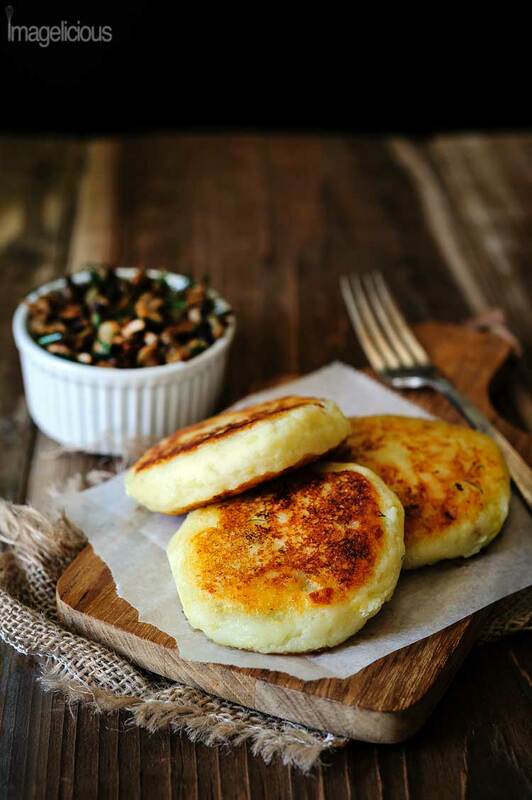 These Vegan Potato Cakes can be made with leftover mashed potatoes or you can make vegan mashed potatoes specifically for this recipe. 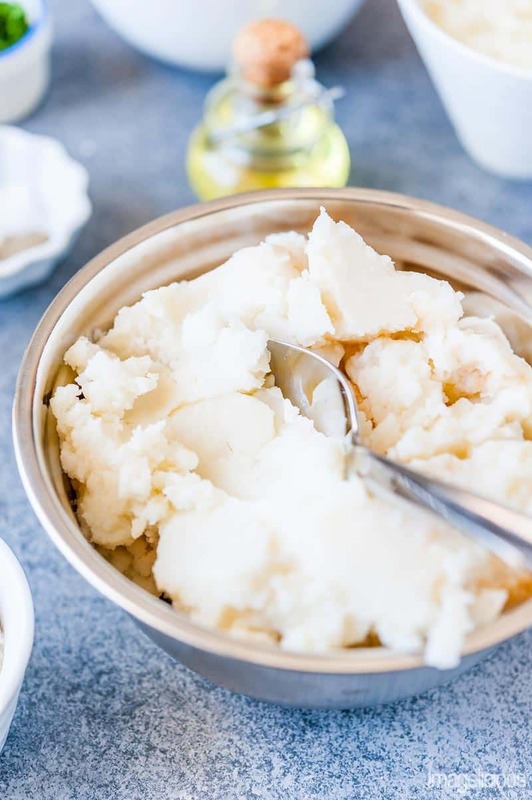 If you are using leftover mashed potatoes then they need to be pretty sturdy and not very thin or you might need to add a bit extra flour to make the mashed potato dough pliable. 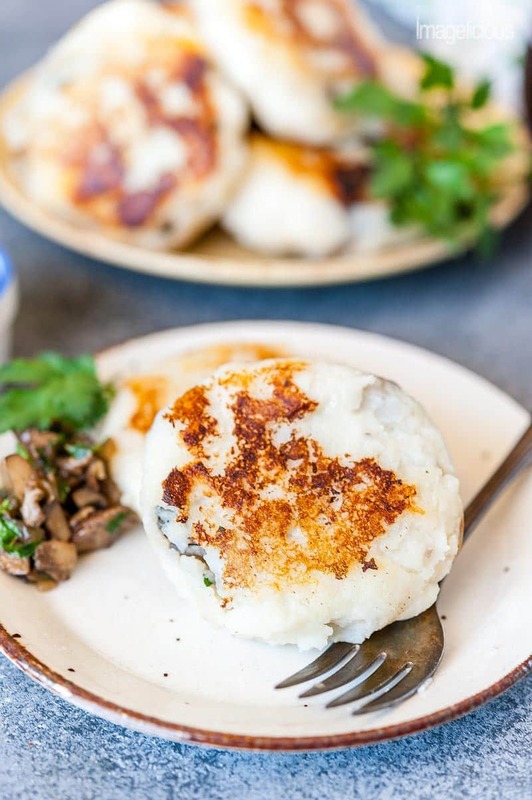 Once the mashed potato dough is made by adding some flour to the mashed potatoes, you just wrap it around a spoonful of your filling (Mushrooms, Onions, and Dill in this case) and form into patties. 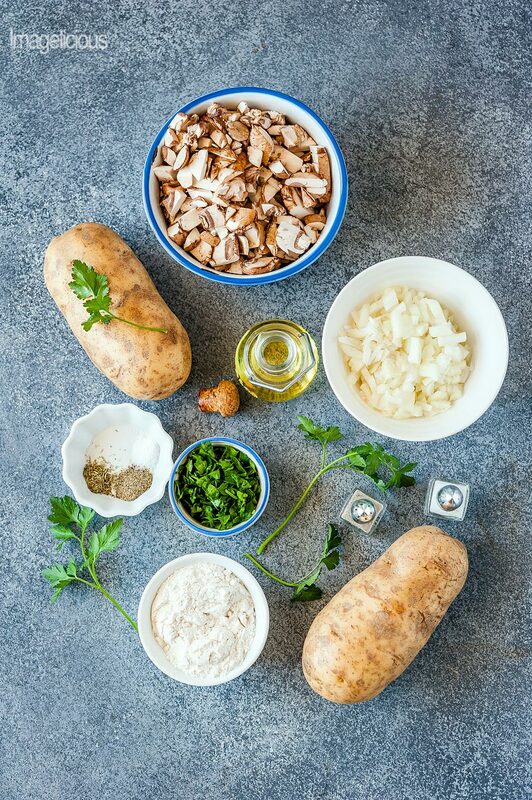 TIP: Assembling the potato cakes could be messy, so for an easier way of doing it, you could just mix the potato mixture and the mushroom mixture together. Wondering if there’s a secret to cooking the most delicious and perfect mushrooms? Check out my article on how to cook perfect mushrooms every time. There’s definitely a secret and you won’t believe what it is!!! You then pan fry the stuffed potato cakes until they are golden on each side. I highly recommend using a very good non-stick pan, otherwise the mashed potatoes might stick to the pan. You might also need to use a bit more oil depending on your pan. My pan of choice is Calphalon. I’ve been using their pans for many years now and I replace them with the same brand and model when they wear out. How much oil is needed to pan-fry these Vegan Potato Cakes? Well, I list 2 tablespoons in my recipe with 1 tablespoon used for the mushroom filling and another one used to pan-fry the Stuffed Potato Cakes. But, here’s the thing, the oil to pan-fry the potato cakes really depends on your pan. If you have a large pan then the oil will spread all over it in a much thinner layer than if you have a small pan. If your pan is non-stick but is well used, it might not be as great for pan-frying these cakes as they might stick without enough oil. Also, some pans and stoves have hot spots so the temperature might be different which would also mean that the potato cakes could stick. So, use your discretion and add more oil if needed. TIP: it is also very often the case that the food will stick to the pan until it is properly cooked. I find that even with my very good non-stick pan, these stuffed potato cakes will stick to the pan for a few minutes, but once the nice and beautiful golden crust is created, they will magically not stick anymore. 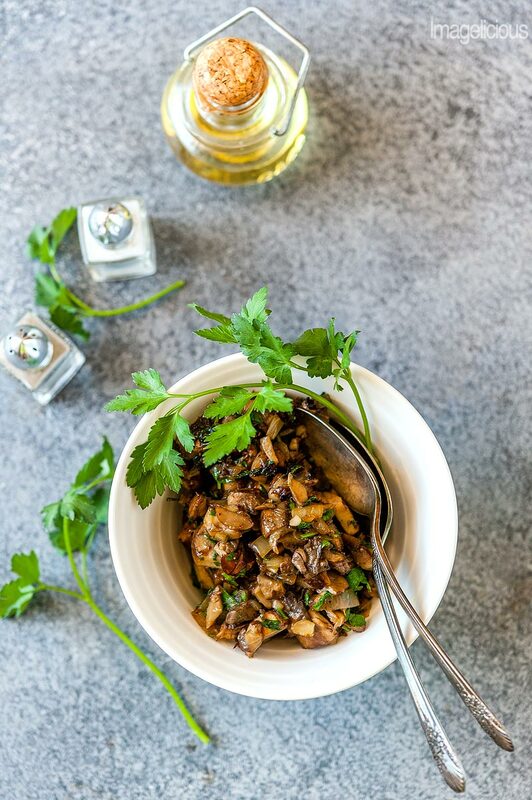 What other herbs can you use with the Mushroom Filling? Dill – this is by far my favourite herb to use with mushrooms! Parsley – this is one of the most common herbs and very traditional, so everyone will love it. Thyme – thyme and mushrooms are a great combination as thyme adds an earthy note to the filling. Rosemary – just a great savoury way to flavour the mushrooms. Would be great around the holidays! Oregano – oregano is not just for pizza or Greek salad, it goes great with mushrooms. 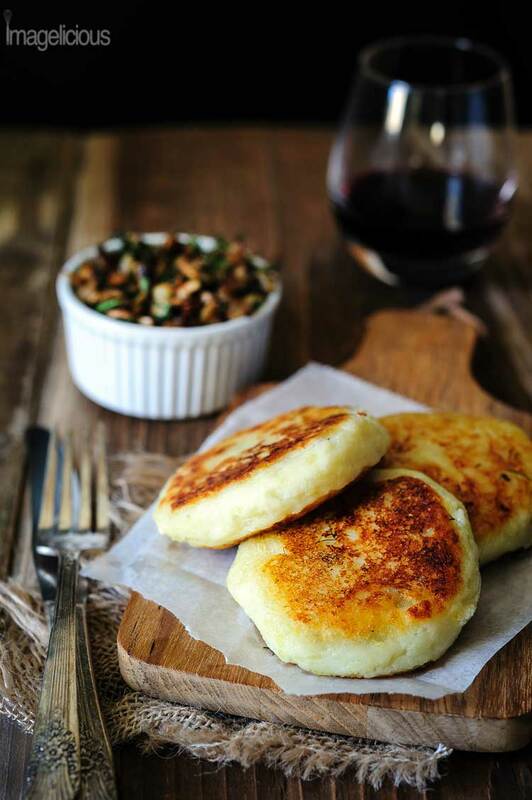 What other fillings can you add to Vegan Potato Cakes? This recipe works really well with leftover mashed potatoes too. Mushrooms and onions are cooked slowly for at least 15-20 minutes until all the liquid evaporated and then a few more minutes to get some colour. Herbs are then added to the mixture. I love dill, it gives the filling summery yet savoury brightness. Some flour is added to mashed potatoes to make a simple dough, then potato cakes are stuffed and pan-fried to get golden colour. 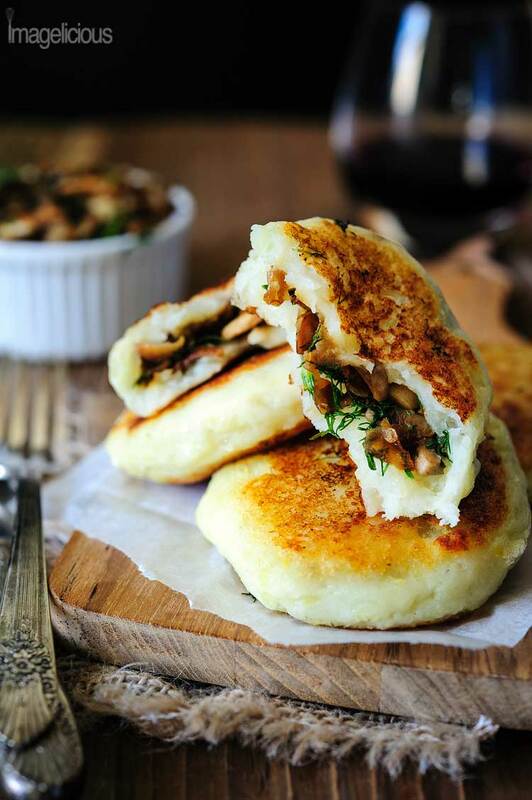 Serve these Vegan Potato Cakes stuffed with Mushrooms with some lemon, mustard or horseradish. 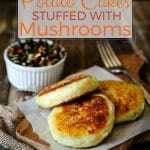 Can you make Vegan Potato Cakes stuffed with Mushrooms using gluten-free flour? I personally have never tried making potato cakes gluten-free but I’ve had readers make these with chickpea or rice flours with great results. If you make them with another type of gluten-free flour, please let me know in comments! Can you freeze these Vegan Potato Cakes? Yes, you can! Freeze the cooked Vegan Potato Cakes in one layer on a sheet pan. Once they are fully frozen, transfer to a freezer ziploc bag or a container. To heat up, defrost over night in the fridge. Then either pan fry them on the stove or use microwave to warm them up. Can you make the Stuffed Potato Cakes without any flour? This is a great question. Flour is used not just to make the mashed potato dough pliable. Flour also changes the texture and flavour of the mashed potatoes. So, they actually taste a bit like dough. If you are able to wrap mashed potatoes around the mushroom filling then you don’t really need to add the flour. Just remember, the flavour and texture will be different from my original recipe. TIP: If you really prefer not to add any flour to these Vegan Potato Cakes then you could mix the mashed potatoes and the mushroom filling together, shape into patties and pan-fry. The Potato Cakes will look a bit different (they won’t be stuffed) but they will still be incredibly delicious! One of my favourite things about this recipe (besides delicious flavour) is that it is a great way to get creative with your leftovers. 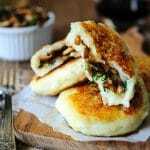 If you like Vegan Potato Cakes stuffed with Mushrooms and would like to try something similar (and a bit easier) then make my Bubble and Squeak Potato Cakes. 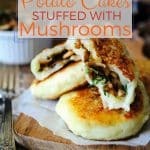 Watch the video below of how to make these delicious Vegan Potato Cakes stuffed with Mushrooms. It’s so easy! You can omit flour or add less than the recipe calls for. I like flour as it makes the potatoes easier to handle, but it certainly isn't necessary. Filling can vary. You can add different herbs like thyme, for example, or parsley. Or add bell peppers. You will most likely have a tiny little bit of the mushroom filling leftover, just serve it alongside the potato cakes. I have a really good non-stick pan (affiliate link) so the cakes don't stick too much, but if you are worried, add more oil to make sure that they don't stick. I know some readers had trouble with the frying part. Note, that quite often food will stick to the pan until it's actually done and only once it's properly cooked, it'll get released. In any case, please add oil as needed when frying the cakes. Also, they can be baked instead of fried. If I baked them, what temp and how long? Loved these! I added riced cauliflower to the mashed potatoes and lentils to the filling. They turned out awesome! I have always failed at making potato cakes, I am not sure what made me decide to give these a go. So glad that I did they were gorgeous. I made 8 not 9 as the recipe asked because that was right for what I needed. I used the leftover mushroom mixture with chilli beans. The potato cakes were all gone by the evening (6 eaten and enjoyed by Omni’s ).